I have a cute little cardinal Christmas ornament, but other than that I have never thought to use cardinals as a theme in my Christmas decorating. 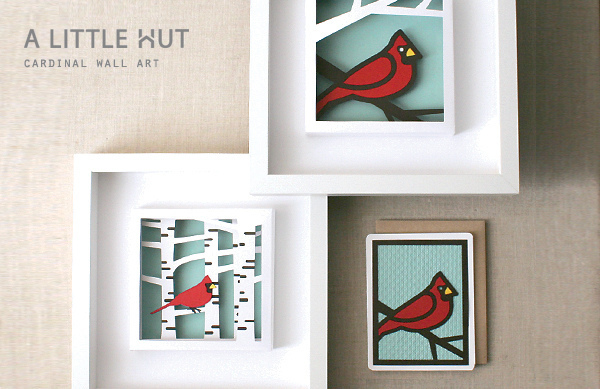 But last year my oldest daughter declared that cardinals were her favorite bird, so I am sure she would love these fun ideas for Cardinal wall art. And the best part is you can leave them up all winter long! You can check out the cardinal wall art over at A Little Hut and if you have a Silhouette, you will be able to download these shapes in their store soon! Very cute! I love that it's a different style of Christmas decor than normal. I LOVE cardinal's, this is adorable!